I though each time I find a solution to a problem I have I should blog it to make sure the knowledge is out there for everyone. This is a super simple one to start with. 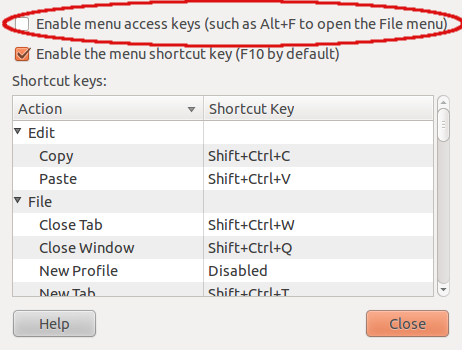 I've been switching from KDE to Gnome in Ubuntu, but been finding it hard to let go of Konsole. Then I realised the the Gnome Terminal allows background images the way Konsole used to. 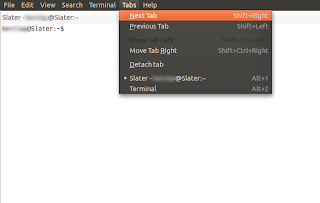 Anyway, that's another post, standard terminal shortcuts weren't working, like Alt+f to skip forward a word and Alt+b to go back a word, as they were conflicting with the window menus, as in the image above. There's a super simple fix. 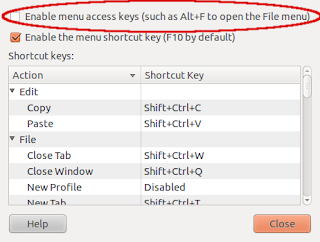 Then uncheck "Enable menu access keys (such as Alt+F to open the File menu)". Then hit close, and that it. Told you it was simple. Almost too simple to be worth a blog post, but I managed to miss it quite a few times (idiot) when looking for it. So it's out there now.